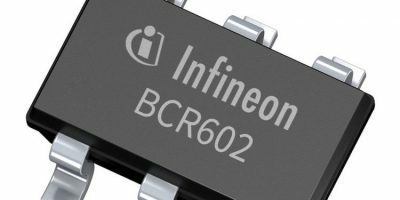 Two linear LED controller ICs have been added to the BCR portfolio, by Infineon Technologies. The BCR601 has voltage feedback to the primary side (also known as active headroom control or AHC), for cost effective and power efficiency LED driver applications. The BCR602 targets dimmable LED applications such as light engines, modules and strips. It has a wide voltage range of up to 60V makes it suitable for 48V designs and DC/DC grids, confirms Infineon. The supply voltage of both LED controller ICs ranges from 8.0 to 60V up to the SELV limit. Both the BCR601 and BCR602, operate with an external driver transistor, either an NPN bipolar transistors or an N-channel MOSFET to support a wide LED current and power range. The ICs allow the LED current to be adjusted by resistors as well as dimmed analogue. The BCR602 also accepts digital PWM up to 3.5 kHz and combined dimming. Both the BCR601 and BCR602 represent an inherent AC ripple suppression, driving a constantly stable LED current to prevent light flicker. Adjusting the minimum necessary voltage across the pass transistor optimises system efficiency which can normally only be achieved by secondary switched mode device, points out Infineon, to reduce component temperatures and stress. This construction also reduces EMI compared to switched mode supplies in combination with a low bill of materials, adds Infineon. Additionally, the BCR601 features an adjustable over-voltage protection to prevent any damage to the LEDs. Both ICs also offer embedded hot-plug protection. This allows connecting or disconnecting the LED load without power down protecting the LEDs from electrical over-stress events. The over-temperature protection reduces the LED current by 30 per cent of the nominal current as soon as the junction temperature exceeds the defined threshold. The LED controller ICs resume regular operation as soon as the temperature drops below the hysteresis.